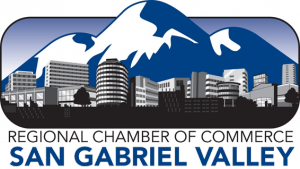 The Regional Chamber of Commerce-San Gabriel Valley is in business to support business. We are committed to strengthening the community by assisting you in achieving your full business potential. We are a voluntary action-oriented organization of businesses and professionals working together to promote the commercial and economic growth of the San Gabriel Valley, and to foster civic improvements that benefit the general welfare of those who live, work and visit here. We advocate on behalf of all business and give a voice to you in the San Gabriel Valley. We help you promote your business, and we communicate with you-by phone, mail or email-the latest events and issues affecting the business in the San Gabriel Valley. We have a full service staff to help you with any needs that may come up. Investment dues paid on an annual basis. Chamber membership is effective when payment is received and active for 12 months from this time. Employees/associates that are affiliated with the listed business are recognized as members and may participate in all activities and benefits (Free events are limited to Chamber’s discretion). Annual investment in the RCCSGV may be tax deductible as an ordinary and necessary business expense. Investments made to the Chamber are not a charitable tax deduction for federal income tax purposes. No refunds on membership.